You must be getting bored of photos of this one. *laughs* I just wish you could see it in person. The photo barely does it justice, especially since you have to inhale the perfectly suitable fragrance that it possesses. (It smells purple!) 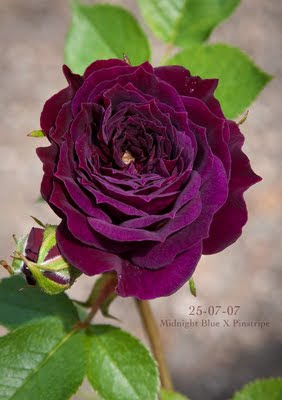 Parentage: 'Midnight Blue' X 'Pinstripe'. Here is an older post about it. This seedling is in line for commercial release in the next year or two, pending propagation of sufficient quantities. Another busy morning; I need to get out and start potting up the hundreds of new seedlings into 3" pots. I am pleasantly surprised by the number of 'Belle Poitvine' hybrids I got from a cross with one of my old R. foliolosa hybrids. I need to use that thing more often, I think. Busy morning, collecting pollen, cleaning up last year's selections, etc, etc., so I will be brief. A great photo of Ralph Moore's experimental seedling "C-04", bred from 'Crested Jewel'. It was hoped to be a useful link to creating better crested Floribunda-style roses, but it was a flop as a breeder: the offspring were duds. But it remains in my collection of curious novelties where it is appreciated regularly for its unique parsley-like sepals. It happens: seedlings get mislabeled. This one was from a batch identified as 'Old Blush' x self, which it clearly is not. Sometimes a few seeds stray into the adjacent row of another cross during sowing, and sometimes a seedling drops onto the work bench during repotting and loses its identity that way. There are numerous ways for an individual to become misidentified. Myriad are the tribulations for the hybridizer attempting to document (accurately?) his work. Alas. For a rose hybridizer, that sudden rush of seedlings flowering for the first time is a lot like Christmas: each one a gift that nobody has ever seen before, the product of much patience and tender cultivation. Such anticipation. Except its a kind if alternate reality Christmas where Tim Burton has made the rules: most of the presents are lumps of coal, with the occasional utilitarian pair of socks in grey or white. Nothing offensive, nothing exciting......and so many lumps of coal. We all aim, us hybridizers, to create diamonds. Lots of 'em. But the reality is that most of what we get is dull chunks of carbon by the bushel. So be it. The diamonds do appear, if only rarely. A throwback to its species origin. Ah well. Perhaps it has a trick or two up its sleeve yet. After all, genetically it has an infusion on both sides of its ancestry of non-Rugosa genes. It might look like an ordinary R. rugosa, but what about its genotype? Maybe it will breed something more interesting. Maybe its not a lump of coal at all, maybe it is a sock after all: a sock with a purpose. So in 2009 I rethought what I was doing with Rugosas and decided to take a rather different route: I combined strongly related Hybrid Rugosas with each other, and with various diploid species. 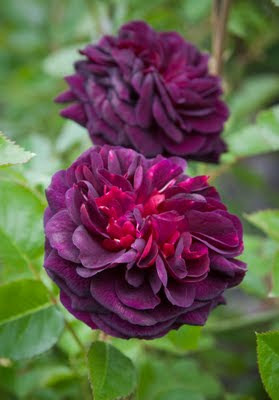 This cross was inspired by David Austin's Rugosa, Mrs. Doreen Pike, a cross of Martin Frobisher and Roseraie de l'Hay. (Don't confuse the latter with aforementioned Hybrid Rugosa I spoke of disparagingly: these two are very different animals.) essentially Austin was crossing two roses of Strong Rugosa pedigree and recovered most of the Rugosa character, while introducing a more double, elaborate bloom form. 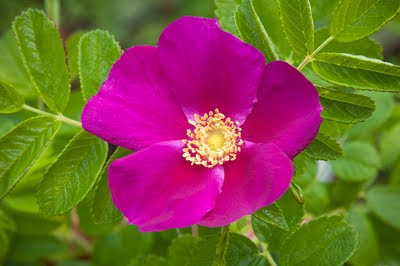 The plant has also recovered much of the Rugosa health, which is a very welcome thing. Back to this seedling, 26-09-14: it is now about 13 months old and about to open it's first bloom. The plant itself is indistinguishable from it's species ancestors, with the same bright green, rugosa foliage and stocky, thorny growth. This seedling, and all of it's 15 siblings, are completely disease free so far, but it's early to make any long term predictions about health until the selections have spend a couple years out in the garden. Still, I sense that these are promising. The exposed petals so far indicate a typical deep Rugosa magenta hue, which isn't a bad thing, in my opinion. I am hopeful some will be more of a red color, something inheritable from Magseed. (by the way, Magseed is a sibling of Linda Campbell, from a cross of the miniature Anytime X Rugosa Magnifica, with blooms that start out a bright Cherry red and fade to more of a magenta.) I am hoping that this seedling picks up some of Anytime's fast and generous rebloom habit. At this point, I can only guess. And hope!